But this time around, on the band’s seventh studio album, Muse have made a conscious decision to take a step back. Instead of jettisoning even farther into the musical stratosphere, Muse is making music that goes back to their roots a bit. On Drones, we hear almost exclusively guitar, bass, and drums; only a few songs feature piano, synths, or strings. This straightforward rock is exactly what we need right now, and Muse is the perfect band to provide it. Given the current music landscape with nary a rock band in sight, Muse is taking a bold step towards something that’s heavier, edgier, and better to simply rock out to. But it’s not all head banging and screaming – Drones is a complex concept album where every word counts in the rapidly unfolding story. Drones plays to Muse’s strength of crafting really great rock songs. The guitars are heavy, the drums stomping, and the songs sound punchy yet melodic. Most of the tracks on Drones will get you pumped up, but a few – “Mercy,” “Aftermath” – balance the album out with some more serenity and emotional efficacy. Oldschool Muse fans may be especially excited to hear Drones: The album has the same feelings that the band’s first albums had. It has the vibe of Origin Of Symmetry or Absolution – the kind of punchy tempo, the blipping spacey instrumentation, the way Matt uses his falsetto. It has a certain magic that Muse had when they started, and it make Drones an album that will make a lasting impact. Muse has always released amazing and impactful music, but this new album has something extra, a special spark that sets it apart. Drones is grandiose without being over the top, emotional without wearing you down. It’s something you’ll want to listen to again and again, and will stand the test of time decades from now. 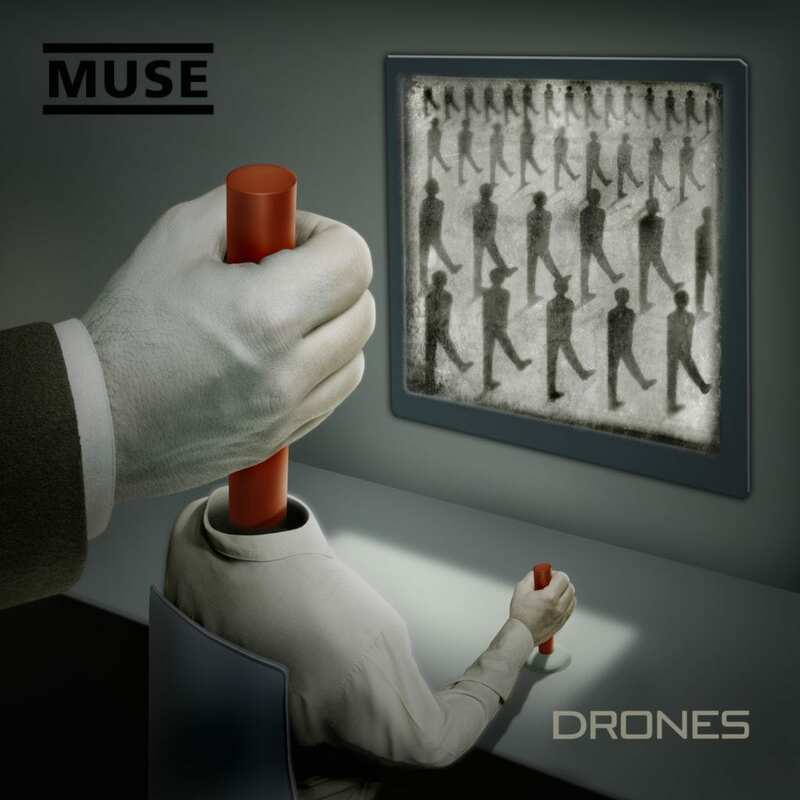 Drones is the best album Muse has put out in a long time, and may well be the best record of 2015. “Dead Inside” – Drones opens on a rather misleading foot, musically. “Dead Inside,” the first official single from Drones, has an R&B flair and a mid tempo groove that doesn’t appear much elsewhere on the album. The song stays fairly flat, never really building up to a true peak. “Dead Inside” stands apart from the others in a lot of ways, but the lyrics set up the story that runs through the record. “[Drill Sergeant]” – This is a short track that acts as an intro to “Psycho,” as we hear an intimidating drill sergeant shouting at a young recruit. The sergeant is tough, but the recruit is willing. This bleeds right into the next track. “Psycho” – “Psycho” was the first Drones song fans got to hear, and it contains a well known riff that Matt finally made use of. This is a fun song propelled by chaotic energy. It’s aggressive and in your face, but it’s upbeat at the same time. The previously introduced drill sergeant will make a psycho killer out of his new soldier yet, screaming instructions at the rookie. The rock dynamism of “Psycho” carries through most of the album, making it fun record to listen to. “Mercy” – Muse takes it down for this hopeful power ballad. “Mercy” sounds strikingly like “Starlight,” from their 2006 album Black Holes And Revelations. It has the piano, the chords, the tempo – and with such a similar arsenal of musical elements, “Mercy” ends up being nearly as pleasant to the ears. It has the perfect build up from verse to pre-chorus to chorus, and puts Matt’s impeccable falsetto to good use. “Mercy” is a song you can get lost in. It may take an extra listen to grow on you, but it will. “Reapers” – The fifth track on Drones is definitely one of the best. After the softer “Mercy,” “Reapers” picks the energy back up. This may recall Origin Of Symmetry the most, with the blippy guitar sound and snarky falsetto in the chorus. The guitar riff takes the song to the next level – it’s heavy as we hear shouts of “killed by drones,” but then the chorus takes on a peppy groove that sounds almost happy. It’s an amusing song, complete with a long breakdown of guitar solos halfway through. It has a trick ending, too, as sirens, “here come the drones” shouts, and heavy guitars wind it down. “Reapers” is the most fun track on Drones. “The Handler” – A stompy slower beat brings it down a bit, with eerie echoes of Matt’s vocals drawing the song out. The pre-chorus takes on a lighter air, creating a floaty feeling that was present throughout Muse’s earlier albums. The chorus is where it really gets big, with crunching guitars and a beat that drops out in a way that makes the song more impactful. This is the point in Drones where our protagonist goes from zombie drone to escapee desperately proclaiming his need for freedom. “[JFK]” – It starts as an excerpt from a John F. Kennedy speech, but Muse makes “[JFK]” darker with heavy, machine-like guitar punches. A lovely orchestra comes in behind that, contrasting with the guitars and President Kennedy’s oration. “Aftermath” – “Aftermath” is the final song in the main Drones narrative, and it provide the closure and positivity needed after such a tumultuous ride. It begins with some chanting, strings, and a bluesy, clean guitar. Matt croons here, his voice soothing rather than fiery. It makes for a grand, epic lullaby. Drums come in after the first chorus, allowing “Aftermath” to build up slowly. It sounds comforting and sweet, but on a large scale. It continues to crescendo after the 4:00 mark, and ends with a lullaby of Matt’s harmonious vocals. “The Globalist” – Whereas the first 10 tracks on Drones tell one story, “The Globalist” tells a similar one but with an unhappy ending. This is the first song in Muse’s catalog to clock in at over 10 minutes, and that gives them plenty of time to build the song piece by piece. “The Globalist” starts with rain. Orchestral strings come in, followed by a clean guitar and creepy, western-styled whistle. After the first minute and a half, a strumming guitar is added to the mix, pushing the song in a new direction. Matt finally starts singing at 2:49, and the addition of drums bring it up a notch. Aggressive guitars change things up around 4:30, and “The Globalist” builds via an eerie choir, strengthening drums, and the feeling of marching people agains the sounds of missiles. Things switch gears around 6:30, when a piano sweeps in to sweeten the mood. Matt croons over it, a choir of “ahhs” behind him. This song is more about the experience, and it plays like a movie. The subtle genre switches keep “The Globalist” fresh throughout its 1o minute duration. “Drones” – “The Globalist” bleeds right into the album’s closer and title track. “Drones” is the only song on the record that is performed solely by Matthew Bellamy; it’s also the only song not composed by Matt. Rather, “Drones” is based on “Sanctus and Benedictus” composed by Giovanni Pierluigi da Palestrina; Matt rearranged the song and added lyrics. “Drones” is an a cappella choir of Matts, all singing different vocal parts that harmonize together marvelously. It’s an understated – but impressive – way to end an incredible album. You can buy Drones on iTunes now.